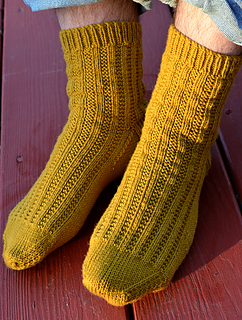 These socks were originally meant for my father-in-law – extra cozy, completely machine-washable, super soft, and a fairly quick knit for the holidays (alright, that last aspect was for me). Thanks to a miscommunication about foot sizes, I had to do a little mental sock swapping. My father-in-law received another pair (which fit much better and which he loved), and the Col. Mustard Socks went to my husband. I’d already made quite a start on the socks and was knitting away when we sat down to watch Clue – and all of a sudden, there was the name! 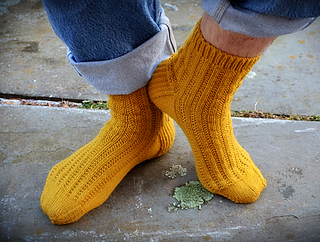 These strike me as exactly the sort of dependable, simple, toasty socks that a character from one of my favorite board games and movies would love to wear. 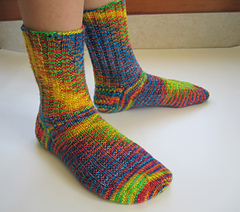 Knit from the top down, full of texture, stretchy through the leg and foot, and easily shortened or lengthened to fit the recipient, these were simple to knit and satisfying. 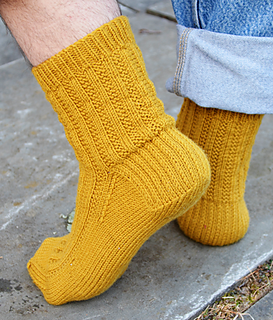 And so the Colonel Mustard Socks were born – enjoy!